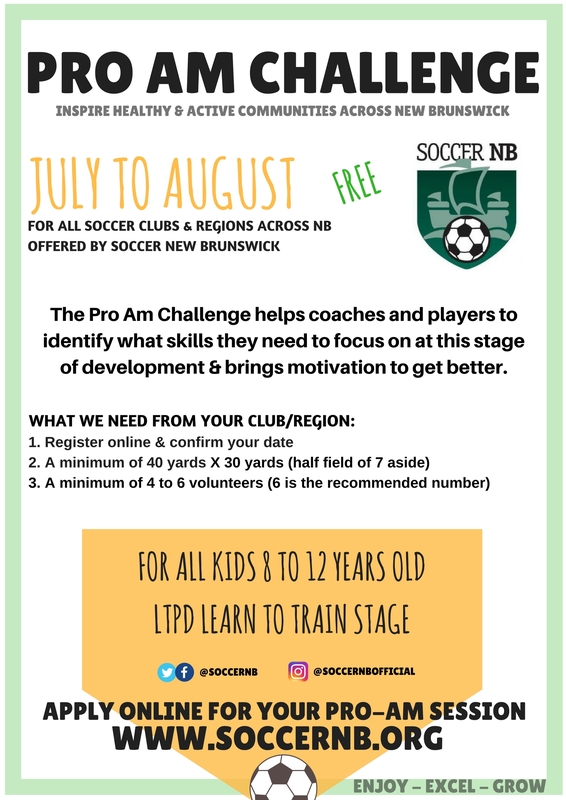 Soccer New Brunswick is proud to announce the sixth year of the Pro Am Challenge. The Pro Am challenge consists of six skill challenges specially designed from the Learn to Train Stage for U8 and U12 players. We are going to be travelling the province with our initiative and want to present it in your region. This sort of activity is not easy to administrate without your help. In order to make this event a success in your region and/or club we ask for a minimum of 4 volunteers that are willing to help for one to two hours! Soccer New Brunswick will be responsible of all the equipment, we only ask the volunteers to help administer the skill tests and write down the scores. At the end of our provincial tour, the players that scored the highest in each region/club will be invited at the Pro Am Fall Event in October. High Performance players will be on hand during this event to interact with the players. The Pro Am Challenge will be offered from July to August. Send us your tentative dates quickly and please note that this event is for the U8 – U12 players only.